The new ready-to-eat salad mixes are becoming an increasingly popular item. I offer four different mixes—herbs, baby lettuce with garden greens, oriental, and a wild mixture. The most called for is the baby lettuce with garden greens consisting of frisee, radicchio, arugula, mizuna, baby spinach, red mustard, rnache, and an assortment of baby lettuces. These mixtures come to you washed three times and hand sorted so they are ready to serve with your best dressing and a few edible flowers sprinkled on top. One of my daughters just returned from the Bay Area and was impressed by the salad mixes as well as the amount of edible flowers they use. Some very fine dining in that area, but she thinks Salt Lake can hold its own in competition! For those of you offering salt-free dishes, have you tried the wonderful ?avor of winter savory? It is at its prettiest now with the tiny pink to white flowers and its spicy peppery taste. The strength of the ?avor seems to increase the longer you nibble on the small green leaves. Always known as the “bean herb," or “poor man’s pepper," savory also reduces the odor of cooking cabbage, brussel sprouts,and cauliflower as well as enhancing the flavor. And did you know savory is used in commercially made salami? And you can make savory jelly using grape juice. Something that really bothers me—well there’s lots of things—but one thing in particular is the sign in the grocery produce section saying “Anise.” Now we all know what they are selling is fennel. The bulb is fennel, the dill-like tops are fennel, and there is just no way it can be anise. The leaf of anise looks agreat deal like cilantro and there is no bulb. Too bad we can’t convince the produce managers that they would sell a lot more if they would call fennel by its right name! delightful flavor to add to dressings and sauces and can be sprouted for winter salads. Fennel has long been known as the fish herb, partly because of the ?avor and partly because it is supposed to counteract the richness of oily fish. The bulb of fennel can be eaten raw or cooked as a root vegetable. Just to make sure we all understand fennel, let me remind you there are two kinds—the herb fennel and Florentine or sweet fennel. 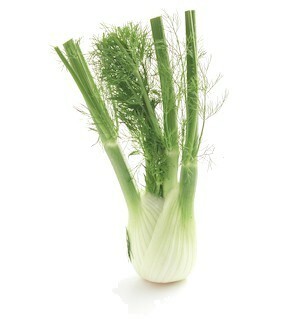 The flavor of the leaf fronds seems to be identical, but it is the Florence fennel which produces the bulbs. Just to add to the confusion, there are two kinds of herb fennel—one bright green and the other bronze-but both have the same scent and flavor. Whatever color or variety you use, try it with fish!